How do the facial nerves work? Each side of the face has its own facial nerve, so damaging the left facial nerve will only affect the left side of the face, and vice versa. Each nerve starts at the brain and enters the face to the front of the ear where it then divides into five separate branches. 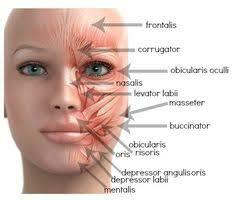 These branches supply the muscles which are used for facial expression. Tears, saliva production and taste are also controlled by the facial nerve in different ways. Viral infections such as Bell’s palsy and Ramsay Hunt syndrome. Surgical causes: for example during removal of acoustic neuroma or facial nerve tumour, or when operating on the parotid gland. Bacterial causes such as Lyme disease or following a middle ear infection. Neurological conditions such as Neurofibromatosis 2, or Guillain-Barré syndrome. Birth trauma: for example caused by forceps or facial presentation delivery. 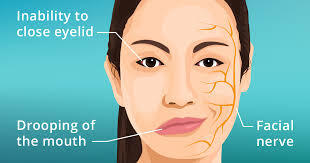 Stroke: although a stroke can cause facial palsy it is slightly different in that the problems are not caused by direct damage to the facial nerve. The paralysis in this case is caused by brain damage and the messages not being transferred properly to the facial nerve. What functions do the facial muscles perform?